I was reading a blog article about how to automate some blogging using the service Zapier. I immediately headed over to the site and used the free account to automate my biggest headache for AllTeamz.com, timely responses from emails sent via our Contact Us page. I use a business account for Google apps and so I was able to create a Trigger for when an email was received from Contact Us and then a task that would then send an automatic response with what is essentially our FAQ posts. 95% of the time this answers any questions our customers might have and is great for them, as well as, me. I immediately decided I could automate all of the tedious tasks I manage daily by building workflows. I am absolutely in love with this service. 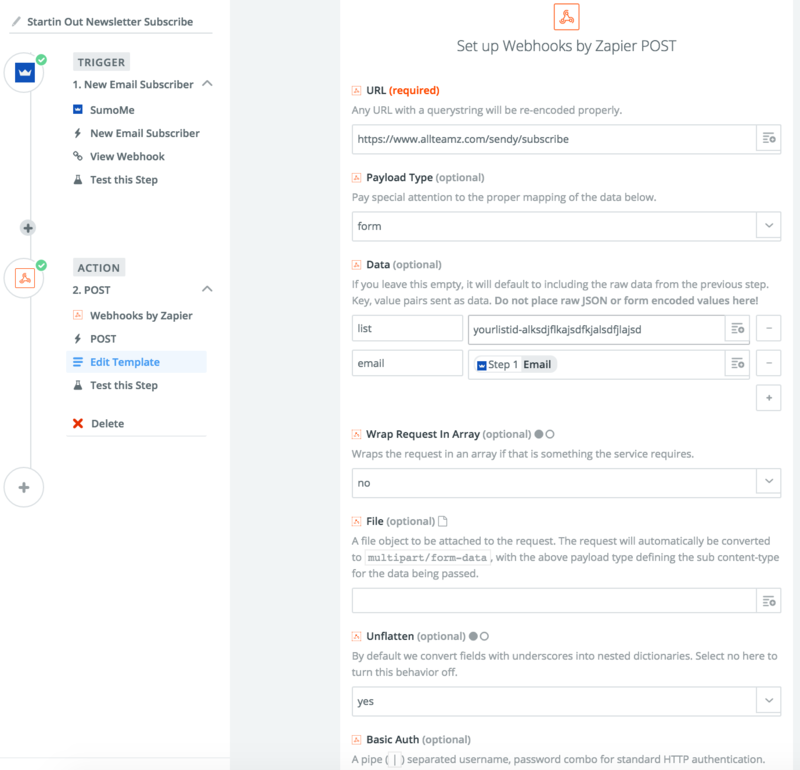 Here are just some of the things I was able to do while automating the workflow for AllTeamz using Zapier. I connected my MySQL database as one of my Connected Accounts. From this I was able to create automatic actions from newly inserted rows. Essentially, when a new customer signs up I am able to Create a new Tweet, Facebook Post, and an SMS automatically including information they just entered in our website to help publicize them to the social world. Check out our newest organization who would love to have your child participate with them, Patriots Fastpitch in Sedalia, Mi. Needless to say, I am ecstatic. The teams on AllTeamz get the much needed push on social and I don’t have to do it manually. Also, I get a text when I get a new customer. Bravo! Lastly, SumoMe. SumoMe is used for all kinds of dropin applications on your site from social plugins to welcome mats for capturing emails in your mailing list. SumoMe connects to Zapier from within the SumoMe app (free to use certain features) and then I use a Custom API post to send that captured data to Sendy. If you don’t know about Sendy, well again, another amazing app that lets you use Amazon SES to send marketing emails using your own hosting solution. Sending 10,000 marketing emails costs you about $1. Back to automation, Sendy sends an automated email to the subscriber who just signed up. I used to do this all manually, but no more. Here are some helpful links to some of these badass apps. Need an assist? Leave it in the comments and I will help you out. Hi Ryan, can you talk about how you integrate SumoMe and Zapier with Sendy? I currently use Zapier to save my SumoMe data into a Google Drive sheet, and then I manually copy/paste that into Sendy. Would be great to skip that step. To get the list ID, login to your Sendy instance and then on the left, select Lists. Mousing over your list will display the list ID, and you can then use it in the field under Data on Zapier with a description of List. Amazing. Thanks so much, Ryan. It works and I didn’t even know it was possible to do this. I’m gonna send your article to the SumoMe team and let them know about this. Sumome are aware of it, the original tweet was favorited by them, as well as by Sendy. Thanks guys. Will make sure to make this easy for other people too. This is amazing!!!! Great job on this.